Click To Listen To What John Hoda From ISI In Milford, Ct.
Has To Say About This Material! A New Lucrative And Booming Frontier For Private Investigative Practice! Learn To Make Up To $5,000 Per Night With Pay-Per-View Public Viewing Of Sports Events! Labs Of Music And Motion Pictures! Piracy, Intellectual Property, Bootleg And Trademark. Mega Shift Trend: Every decade or so a mega shift occurs that have a drastic impact on private investigative assignments. There is now a quite mega shift that has been building which is now reaching epidemic proportions. Because of the advancements in technology, it has become extremely easy to pirate, repackage, duplicate and sell motion pictures on DVDs and video cassettes, music CDs, pay-per-view cable events, trademarked goods, software, books and just about anything else. Piracy Epidemic: Across this nation and throughout the world a quite epidemic is taking place that is costing business and industry literally trillions and trillions of dollars. It's now estimated by experts that one out of every three music CDs sold in the market place is a pirated CD. A good forty percent of all software now used is pirated. The motion picture industry is losing billions of dollars from pirated DVD disks and video cassettes. Millions of dollars in funds are lost in publicly broadcast pay- per- view sporting events because bar owners throughout the USA know these events will fill the house and the stealing of the cable TV broadcast is so easy to do.In fact, experts now confirm that seven percent of all goods sold in the world are illegal pirated goods. Let me say that again! "SEVEN PERCENT OF GOODS SOLD IN THE WORLD ARE PIRATED GOODS!" The Seven Percent Factor: Because of this "seven percent" factor, there is a way for private investigators to steam the tide of the swelling problem of piracy and build a thrieving investigative practice around it. Many of those investigative agencies who already have done so, actually have more work than they can handle. 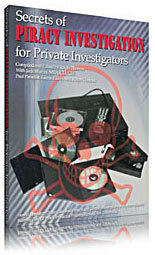 Many private investigators have tried their hand at pirated per-per-view cable events in sports bars but a good ninety percent of them who have tried it- either didn't have the right direct source for assignment to these events or did not take the required pre-investigative steps and easy to understand investigative techniques needed to make the investigation pay off. From the right direct source of assignment and making use of the right investigative techniques, it's not uncommon for this evening of work to bring the investigator between $1,500 to $4,000 for a few hours of work. Way Beyond Mere Pay-Per-View Cable Piracy: With this training material, you learn how to become extremely successful with cable pay-per-view pirated public broadcasts but this manual goes way beyond this type of piracy. You are shown in step-by-step detail how to get assignments to and work cases involving pirated music duplication operations, pirated motion picture operations, trademark counterfeiting and software piracy. Federal law enforcement is now stating that piracy is becoming the number one white collar crime throughout the world. This is a ground floor opportunity for private investigators. The Trend Is Ripe: There now exists a huge and wide open opportunity for private investigators to work these types of cases and reap huge rewards. These types of cases are very easy to get assigned to and offer an almost unlimited flow of case assignments because various forms of piracy is now taking place everywhere and at alarming epidemic proportions. This new training program arms you the the specialized set of investigative and legal knowledge as well as the contacts you need to have to work these types of cases. This is absolutely a ground floor opportunity to flood your office with tons and tons of work! Up To $5,500 A Night! On a recent fight, a private investigator in Dallas, Texas uncovered and caught 22 (count them, that's 22!) pay-per-view piracy cases in which he was paid $250.00 a case. That's $5,500 for a night's work and a few hours of beforehand preparation. Not only that, this same investigator will almost always obtain further after the event assignments billed out at an hourly rate as a direct result of the pirates he caught in the first place. Up To $100,000 In Music/Motion Picture Piracy: Music pirates are everywhere duplicating fake CDs from originals because it's such an easy crime to commit. The pirated duplication of motion pictures onto blank DVDs and video cassettes is a massive criminal problem. Many private investigators are already involved in these kinds of cases and obtaining huge retainers and "on spec" finders fees! In fact, you can obtain rewards of up to $100,000 for the location of a motion picture piracy duplication lab when your find meets certain specifications. With the right training, these criminals are easy to spot when you know where to look and what to look for. This training program arms you with the know-how. With your help, you can stop these thefts dead in their tracks and make very substantial investigative fees while doing it. Counterfeiters are all over the world. They are easy to spot and a vast flow of cases awaits you to stop this crime that is costing businesses trillions of dollars. Uncrowded Field, Act Now! You must act NOW and stay ahead of the curve as far as getting your private investigative practice involved in these types of cases. The epidemic is waiting for you to stop. If you are involved in private investigative practice, this is just the opportunity you have been waiting for.